After the last Blood Moon lit up the skies in the east in July 2018, stargazers in the west are excited to see the upcoming eclipse. On the morning of Monday, January 21, in the UK, the Full Moon will pass through Earth’s shadow and take on a deep red hue. Space agency NASA expects the Moon to each eclipse totality in the early hours around 5.13am GMT (UTC) over North and South America and parts of Europe and Africa. From start to finish, the eclipse will clock in at three hours and 17 minutes and totality will last one hour and two minutes. And if you were on the fence about witnessing the Blood Moon in person, this will be your last chance to see a total lunar eclipse until May 2021. Between now and May 2021, there will be a total of six lunar eclipses, with the January one included. But this month’s lunar eclipse will be the only total eclipse for more than a year. Instead, a partial eclipse of the Moon will peak on July 16, 2019, followed by four penumbral eclipses. Unlike a total eclipse, a penumbral eclipse occurs when the lunar orb passes through the outer portion of the Earth’s shadow, resulting in a less than spectacular show. 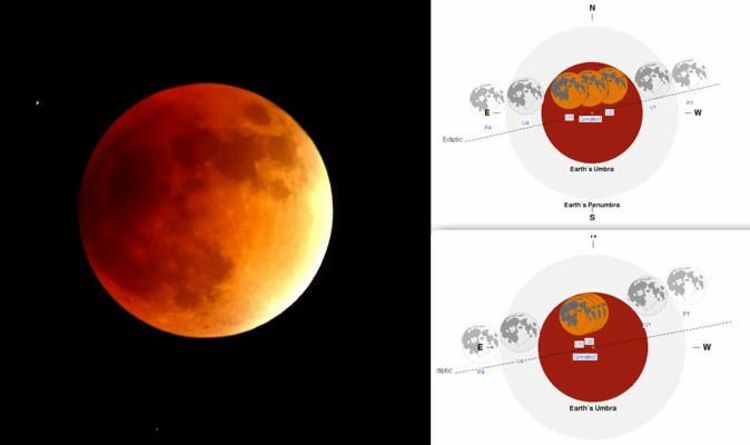 Astronomer and EarthSky founder Deborah Byrd said: “In a penumbral lunar eclipse, only the more diffuse outer shadow of Earth falls on the moon’s face. “This third kind of lunar eclipse is much more subtle, and much more difficult to observe, than either a total or partial eclipse of the moon. READ MORE: Where will the January eclipse be visible? A penumbral eclipse never quote reaches totality and only the most observant astronomers will notice a dip in brightness from the Moon. Most stargazers are unlikely to see any difference in the way the Moon looks at all. The next total lunar eclipse Blood Moon will appear before noon GMT on May 26, 2021. The eclipse will reach totality around 11.19am GMT (UTC) one East Asia, Australia, the Pacific and North and South America. NASA estimates the eclipse will last about three hours and seven minutes. Totality, however, will only last 15 minutes so you will have to keep your eyes peeled. The next Blood Moon after that will rise on May 16, 2022. The 2022 eclipse will spend one hour and 25 minutes in totality over North and South America, Europe and Africa.